Greenwich Inn Sydney Hotel 1800-633-680 – The Greenwich Inn is a Boutique Hotel with an intimate and friendly atmosphere, offering a variety of bedroom types, all finished to 3½ to 4 star standard. These include all ensuite rooms with Double or Queen Beds and Family Rooms which sleep from 3-5 guests. High speed Wireless Internet is available to all rooms. The Greenwich Inn is a Boutique Hotel with an intimate and friendly atmosphere, offering a variety of bedroom types, all finished to 3½ to 4 star standard. These include all ensuite rooms with Double or Queen Beds and Family Rooms which sleep from 3-5 guests. High speed Wireless Internet is available to all rooms. The Greenwich Inn is a 35 room Boutique Hotel with an intimate and friendly atmosphere, offering a variety of bedroom types, all finished to 3½ to 4 star standard. These include all en-suite rooms with Double or Queen Beds and Family Rooms which sleep from 3-5 guests. High speed Wireless Internet is available to all rooms. With highly competitive room rates, the three-and-a-half star AAA-rated Greenwich Inn Sydney Hotel is one of the best value north Sydney hotels on Sydney’s Lower North Shore. 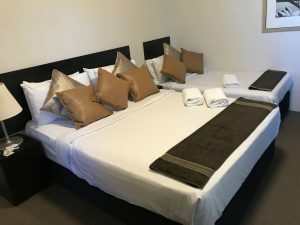 Located in St Leonards and with prized free off-street parking and secure, clean, freshly painted and carpeted, comfortable rooms, the Greenwich Inn is the perfect hotel for your next Sydney visit. The Greenwich Inn Hotel’s complete refurbishment was finished in March 2018. With fresh paint and new carpets throughout, all rooms now offer sound-proof windows, new air conditioners, new bathrooms, all new designer furnishings, new beds, flat screen TVs with DVD players and Foxtel. Guests have access to a fully-equipped kitchen (with stove, oven, microwave, appliances and utensils) if they wish to prepare their own meals or a simple snack. 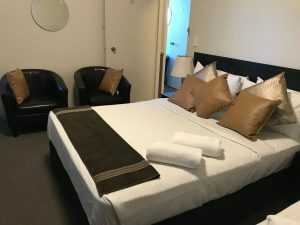 The Greenwich Inn Sydney Hotel is an ideally located great value and comfortable Sydney hotel in leafy St Leonards, the heart of Sydney’s lower north shore. Convenient to the suburbs of North Sydney, Chatswood, Lane Cove, Artarmon, Crows Nest, Greenwich and St Leonards, the Greenwich Inn Sydney Hotel is central to Sydney’s leafy lower North Shore. 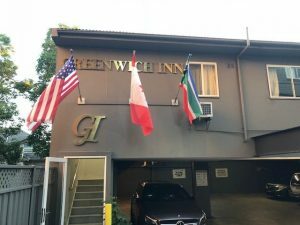 The Greenwich Inn Sydney Hotel offers highly competitive corporate rates for businesses and trades looking for comfortable and well priced accommodation. The Greenwich Inn Sydney Hotel lies a convenient distance from North Ryde Business Park, Lane Cove West Business Park and companies in North Sydney, St Leonards and Chatswood. Contact us for our rates. Only 300 metres flat walk from Royal North Shore Hospital (closest hotel to RNSH) and North Shore Private Hospital and less than ten minutes walk to St Leonards Forum shops, cafes and rail station, the Greenwich Inn provides easy access to the Sydney CBD, the famous Sydney Harbour attractions and North Sydney by train, bus or taxi. The extensive shopping centres of Chatswood and well-known Crows Nest restaurants are only a mere five minutes away by public transport or car. Whether for business or pleasure, the Greenwich Inn Sydney Hotel is the ideal hotel for your Sydney stay. Katrina and Ravi are ready to assist you with your booking. © 2010-19 Greenwich Inn. All rights reserved.